First you’ll need to trim the bottom couple inches of your asparagus. You can either snap it with your fingers, or cut it all in one fail swoop. Then wash, drain, and lay asparagus flat to dry. Then slice your whole pepper flowers in inch rings. Then you can trim out any seeds or membranes. You’ll want thick slices for the peppers so they make a nice border for the egg to stay inside of. Then wash and slice your strawberries in half long ways and you’re all prepped to cook! Asparagus: On a tin foil lined baking sheet, drizzle two tablespoons of olive oil over your trimmed asparagus. Sprinkle with kosher salt and fresh cracked black pepper and put in a 400 degree Fahrenheit oven for 20 minutes. Peppers: Heat a skillet with a tight fitting lid to medium and warm 1 tablespoon of olive oil, brown one side of the ring about 1 minute and then flip. Immediately crack your egg into the center of the pepper. Let the egg cook for about one minute and pour a 1/4 cup of water around the peppers and cover. Let it cook for 2-3 minutes or as tender as you like your yolk. 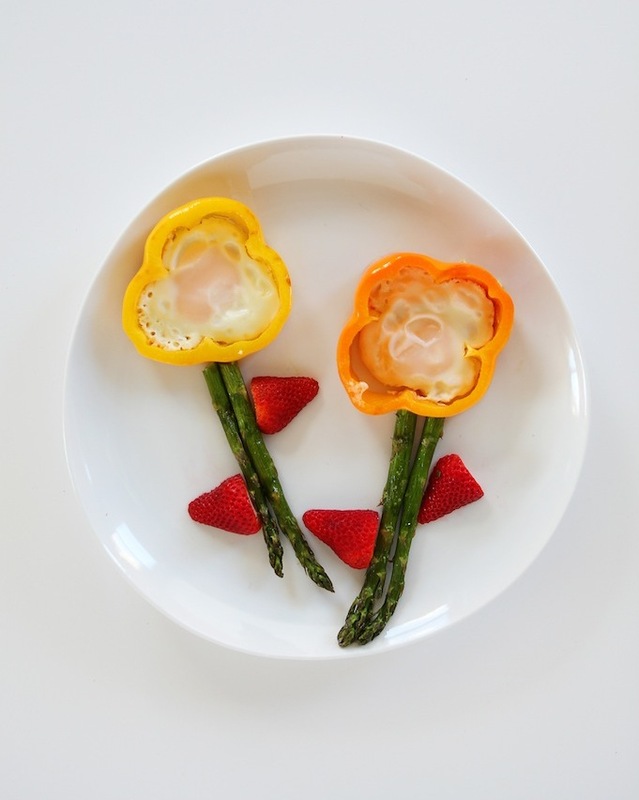 Once your veggies are cooked now you can assemble the flowers! 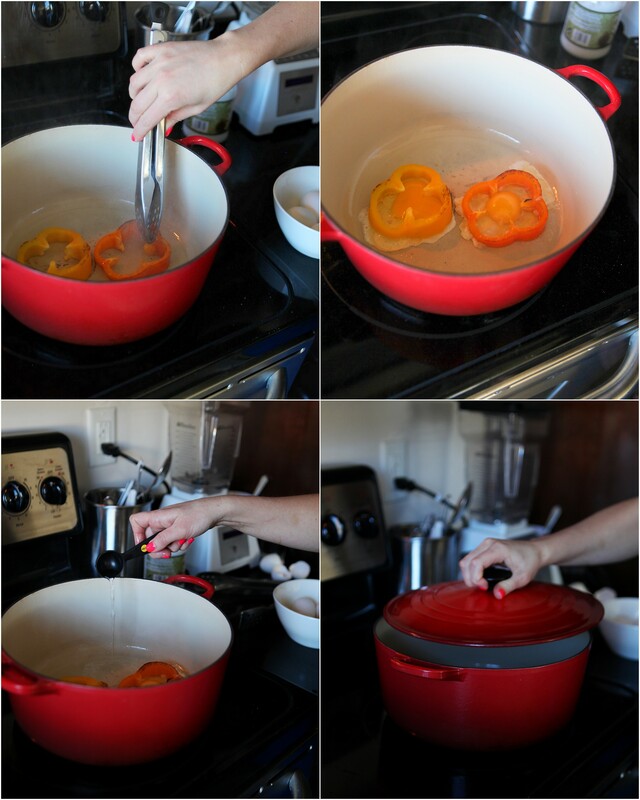 Use a spatula to transfer your peppers and eggs to the top of a wide plate. 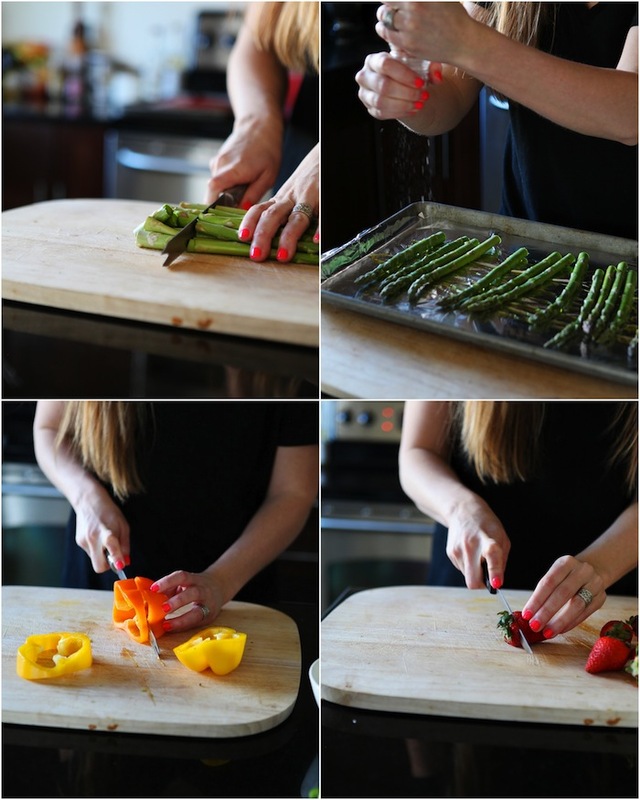 Then add a couple stems of asparagus and halved strawberries as the leaves. Salt and pepper your eggs as desired and enjoy! 2 bell peppers in red, orange or yellow. Wash asparagus, drain and place evenly on a tin foil covered cookie sheet. Drizzle 2 T over top and sprinkle salt and pepper as desired. Cook at 400 for 20 minutes. On medium heat warm 1 T olive oil in skillet. Slice bell peppers width wise in about 1 inch thick pieces and place them in oil. After one minute flip to other side. Crack egg directly in to the center of the bell pepper. Let fry for one minute. Pour water in the skillet around the peppers to steam, and cover with lid. Let cook for 2-3 minutes or until yolk achieves desired tenderness. A kid-friendly cleanse, our favorite on-the-go snacks, and a printable chart to encourage adventurous eating. That’s the cutest food art I have ever seen.